LicenseQuote is a complete music licensing e-commerce solution which makes it easy for artists, composers, record labels and music libraries to license their music from their own websites and keep 100% of their sales revenues. 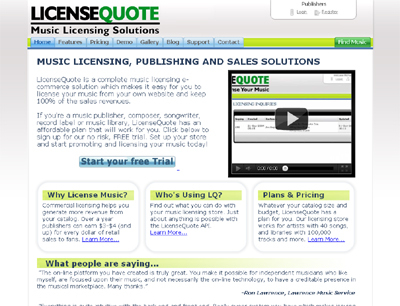 With LicenseQuote publishers can easily setup a white label Licensing Store that includes a catalog, song previews, instant price quotes (publisher controls pricing), advanced on-line negotiation mechanism, automated contract and invoice generation, billing, master files delivery, customer relations management, and more. Superior business model (keep 100%), professional tools like no others.